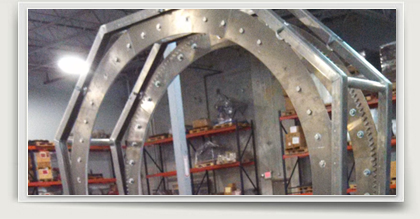 As a local leader in metal cutting technology and implementation, PEC Laser is highly familiar with creating custom solutions for our clients. Recently, we uncovered an opportunity to create a custom solution for our own benefit: designing, fabricating and laser cutting our own orbital pallet wrapper. PEC Laser needed an orbital stretch wrapper that was customized to our needs and larger than other pallet wrappers available on the market today. 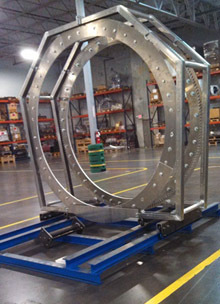 PEC Laser created its own custom orbital stretch wrapper, utilizing our expertise in laser cutting, bending and welding. We engineered this piece specifically for forklifts, making it possible to place the pallet through the unit while the machine rotates and wraps the material on the skid or pallet. This unit will improve our productivity and is safer for our employees. For years, we've saved our customers money by utilizing our laser fabrication capabilities, and fortunately, we were able to benefit from the same capabilities. Not only did manufacturing our customized orbital stretch wrapper work within our budget, it is also a testament to our solution based skills and expertise in metal laser cutting!